"Perhaps a Star Trek experience within our lifetime is not such a remote possibility." These are the words of Dr. Harold "Sonny" White, the Advanced Propulsion Theme Lead for the NASA Engineering Directorate. Dr. White and his colleagues don't just believe a real life warp drive is theoretically possible; they've already started the work to create one. Yes. A real warp drive, Scotty. When it comes to space exploration, we are still cavemen. We got to the Moon and sent some badass robot to Mars. We also have those automatic doors that swoosh wide open when you get near them, but that's about it. It's cool, but we are far from being the space civilization we'll need to become to survive for millennia. 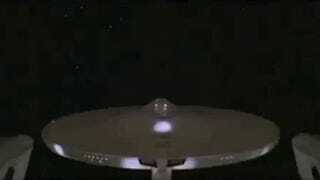 With our current propulsion technologies, interstellar flight is impossible. Even with experimental technology, like ion thrusters or a spaceship's aft pooping freaking nuclear explosions, it would require staggering amounts of fuel and mass to get to any nearby star. And worse: it will require decades—centuries, even—to get there. The trip will be meaningless for those left behind. Only the ones going forward in search for a new star system would enjoy the result of the colossal effort. It's just not practical. So we need an alternative. One that would allow us to travel extremely fast without breaking the laws of physics. Or as Dr. White puts it: "we want to go, really fast, while observing the 11th commandment: Thou shall not exceed the speed of light." The answer lies precisely in those laws of physics. Dr. White and other physicists have found loopholes in some mathematical equations—loopholes that indicate that warping the space-time fabric is indeed possible. By creating one of these warp bubbles, the spaceship's engine will compress the space ahead and expand the space behind, moving it to another place without actually moving, and carrying none of the adverse effects of other travel methods. According to Dr. White, "by harnessing the physics of cosmic inflation, future spaceships crafted to satisfy the laws of these mathematical equations may actually be able to get somewhere unthinkably fast—and without adverse effects." He says that, if everything is confirmed in these practical experiments, we would be able to create an engine that will get us to Alpha Centauri "in two weeks as measured by clocks here on Earth." The time will be the same in the spaceship and on Earth, he claims, and there will not be "tidal forces inside the bubble, no undue issues, and the proper acceleration is zero. When you turn the field on, everybody doesn't go slamming against the bulkhead, which would be a very short and sad trip." There was only one problem with all this: where does the energy come from? While we knew that warp drives were theoretically possible, physicists have always argued that they would require a ball of exotic matter the size of Jupiter to power it. Clearly, that was not practical. But thankfully, Dr. White has found a solution that changes the game completely. The Eagleworks team has discovered that the energy requirements are much lower than previously thought. If they optimize the warp bubble thickness and "oscillate its intensity to reduce the stiffness of space time," they would be able to reduce the amount of fuel to manageable amount: instead of a Jupiter-sized ball of exotic matter, you will only need 500 kilograms to "send a 10-meter bubble (32.8 feet) at an effective velocity of 10c." Ten c! That's ten times the speed of light, people (remember, the ship itself would not go faster than the speed of light. But effectively it will seem like it does). That means that we would be able to visit Gliese 581g—a planet similar to Earth 20 light years away from our planet—in two years. Two years is nothing. It took Magellan three years to circumnavigate around our home planet—from August 1519 to September 1522. A four year roundtrip to see a planet like Earth is completely doable. And there are even closer destinations where we can send robots or astronauts. The important thing is that there is now a door open to a different kind of exploration. That, like Dr. White says, "perhaps a Star Trek experience within our lifetime is not such a remote possibility." We may be witnessing the very beginning of a new age of space exploration, one that would finally take us from our pale blue dot back to where we belong. I don't know about you, but I'm more excited than when Captain Kirk got his first unobtonanium underpants. RELATED READING: Astronomers estimate there are 17 billion Earth-sized planets just in our Galaxy. That means our Universe is bubbling with life, perhaps with as many as 7.99 billion civilizations. How many of those have warp travel capability?